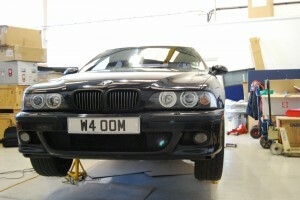 We were doing a spot more work on the M5 today (unfinished – hopefully more on that tomorrow!). 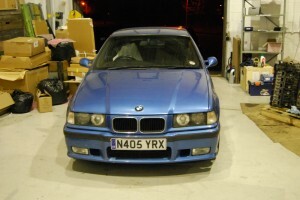 I needed to nip out and grab some more tools, so I took the M3 we repaired over Christmas. A section of road between Robin’s tool shed and Ben’s workshop is one of my all time favourites. It’s not that I’ve never driven an M3 Evo before – I’ve owned two – but today was an opportunity to pilot one along that favourite road just hours after I’d whisked the M5 that way; excellent comparison material. That’s all I’ll focus on here – the driving. Running costs and cupholders aren’t going to factor! Today was cold – minus 4 degrees at midday. Come to think of it, I can’t recall temperatures that low during the day, nor such a prolonged wintry spell. As a result the roads were extremely slippery, tyres not up to temperature, and it’s also worth mentioning that the M3’s tyres are significantly newer and in better shape than the M5’s. The road opens up and the hammer drops. The M3 Evo is fast, but it’s not M5 fast. The gearbox is a little notchy, just like the big 5. Here comes the first corner. The brakes are strong, but aren’t BMW brakes always strong until they overheat? I know this corner well, I know that at this speed the M5 won’t turn in so well, and it’ll wash a little wide. The M3 is pin sharp, and tracks my intended line perfectly. Squeeze the throttle on exit. The M5 would, in these conditions, require judicious use of the controls. The M3 just grips and goes, but again, its tyres are better. It’d get around the corner quicker, but the M5 would catch it once things straighten up again. Ahead though, the road gets fierce: it ducks left and right over hills, camber is cruel, the surface is slippery. The M5 can’t attack in these conditions. It’ll thump along making a gorgeous noise, and if I’m brave it’ll be a lot of fun, but it can’t really address the situation. The M3 is lithe by comparison; its more direct steering and lack of weight more than makes up for its 80 horsepower deficit. Here, the M3 is better. Which makes me wonder, is there a time when point to point performance is the goal, where the M3 isn’t the favourable vehicle? Maybe on an autobahn, otherwise though, the M3 is the tool of choice. So it’s just as well that I’m considerably less interested than I used to be in getting from point to point quickly. As I age I’m more interested in lounging around in my V8 ambience listening to Radio 3. The M3’s engine has an entirely reasonable amount of grunt at low revs, but the M5’s V8 has muscle power right from idle. It’s simply the best engine I’ve ever owned. But it’s no track car; it can leave that to the M3. Does this mean the M5 will not see the Nurburgring?